Increasing complexity and higher integration of electronics leads to new challenges in system optimization. This is because modern systems contain structures with multi-scale geometries whose responses are determined by multi-physics simulations and often times contain components that are electromagnetically coupled. In practice, the use of optimization algorithms in the design cycle of such systems is limited to fine-tuning an already good design, which requires substantial human intervention and CPU time to arrive at an optimum solution. This is mainly due to lack of methods capable of handling high dimensionality at the same time converging to the global optimum regardless of the initial point selection. We therefore present a new, EDA oriented method, utilizing machine learning techniques to perform black-box optimization that starts with zero training data and ensures convergence to global optimum in the minimum amount of CPU time. In order to consider uncertainties in fabrication that are likely to cause deviations in the final design from the optimal design parameters, we present a ML-based uncertainty quantification (UQ) methodology. 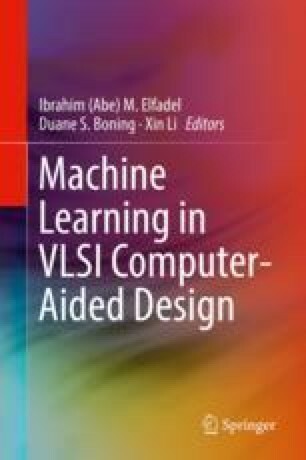 Although the combination of optimization and UQ algorithms presented in this chapter are fully automated and generic, we demonstrate these methods on an emerging application in system integration and power delivery, namely integrated voltage regulators (IVR). The IVR considered here is based on system in package (SiP) technology. This work was supported in part by the National Science Foundation under Grant No. CNS 16-24810—Center for Advanced Electronics through Machine Learning (CAEML) and Power Delivery for Electronic Systems (PDES) Consortium, Georgia Tech, USA. The authors would also like to acknowledge Dr. Mohamed L. F. Bellaredj, Dr. Anto K. Davis, and Dr. Colin Pardue for their assistance in simulation and analysis of the IVR.